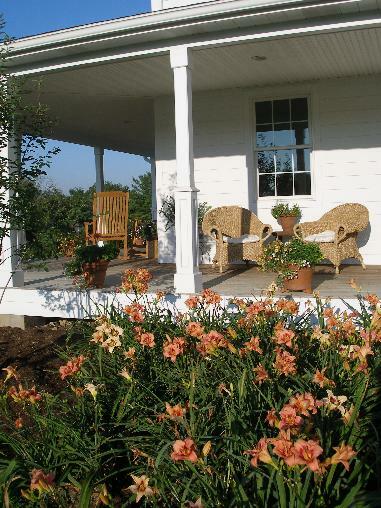 Enjoy a summer morning on our porch! In March 2005 we finished construction of our new home and Bed and Breakfast at 176 Brush Valley Road, the site of our perennial nursery. Bed and Breakfast at The Rock Garden is located in Oak Hall, a small village between Lemont and Boalsburg just off the 322 bypass near State College, Pennsylvania. We are within ten minutes drive, and less than five miles from State College and Penn State's Beaver Stadium. Bed and Breakfast at The Rock Garden offers five guest rooms each with its own private bathroom. Queen size beds are in four of the guest rooms, and there are two twin beds in the fifth room. Each guest room has a view of Mt. Nittany or of the Tussey Mountain range in addition to views of our gardens. Please keep us in mind when you have guests traveling to our area, or if you are out of town and planning a visit to Happy Valley. Take advantage of a 10% discount at the nursery while you are our guests at the Bed and Breakfast! Reservations can be made either by calling us at 814-466-6100 or at 888-620-7625. Or you can check our availability and request a reservation online. Please visit our website at www.therockgardenbandb.com for more information and photos of the B&B. We are members of the Pennsylvania Mid-State Bed and Breakfast Association and of the Professional Association of Innkeepers International.